Blogging is an awesome hobby and side hustle. I’ve been interested in blogging since I was in high school, and now I consider myself a blogger: I have my own blog that’s been going strong since 2014, and blogging is a big part of my full-time job. But these weren’t my first two blogs—I’ve had many over the years. 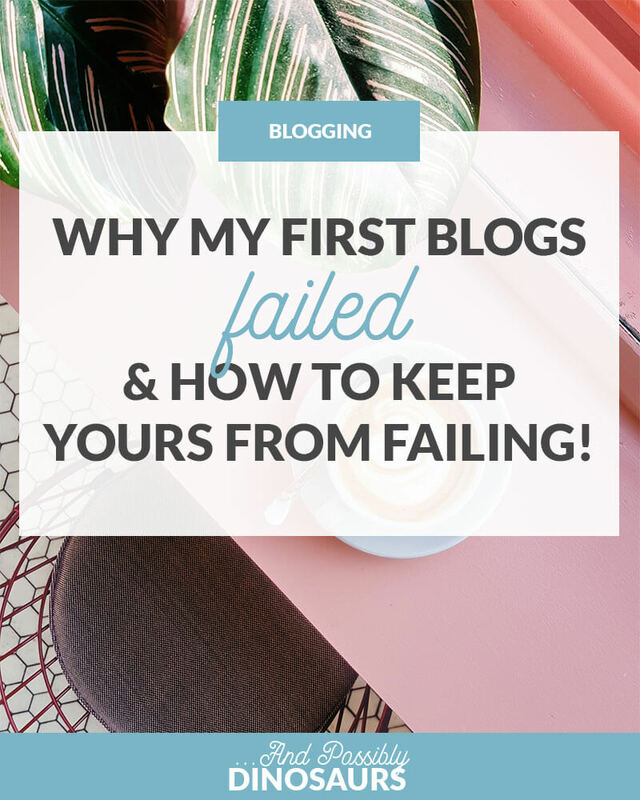 Here’s why those blogs failed, and what you can do to prevent the same thing from happening to you! They weren’t focused on a specific topic. The biggest reason my other blogs failed is because they weren’t focused on a specific topic. I blogged about whatever I wanted, often as a means to vent, rather than making an actual point or helping my audience. No one knew what topic I would write about next (myself included). Plus, I didn’t have a specific target audience in mind. I was simply throwing the words out into the universe and hoping it would resonate with someone. This caused my blog to fail because, not only was it unpredictable, but I also didn’t feel a strong tie to the content. I could write about anything, so in the end I wrote about nothing. In order to prevent this on your own blog, pick a list of topics you want to write about and stick to those as best as possible. Don’t feel limited by this; sometimes, the more targeted you make your blog, the easier it can be to come up with content ideas! If you can’t narrow it down to a specific niche, pick a target audience and write content relevant to them. I’ve got an ideal reader worksheet in my free resource library that can help you figure out who your ideal reader is and what content they’re most interested in! I didn’t have a posting schedule. On a similar note, my old blogs failed because I didn’t have a posting schedule. I wrote about whatever I wanted, when I wanted. Sometimes I would write several times in a week, other times I’d take a month or more off. This is really hard on an audience, because they don’t know when to expect new content to go up. If you want them to come back, make it easy for them! Let them know when new content comes out so they can be ready for it! The easiest way to create a posting schedule for your blog is to get an editorial calendar. I’m a big fan of CoSchedule, but if it’s out of your price range, you can also use a spreadsheet. I’ve got a blogging spreadsheet in my free resource library that includes an editorial calendar you can use! The important thing isn’t the tool you’re using, it’s that you’re planning out your content and posting consistently. Keep in mind, I said consistently, not frequently. Be realistic with yourself: how often can you write content? (The answer might not be daily, and that’s okay!) Set a realistic goal, so you’re not always disappointing yourself because you “don’t post enough.” You’re posting enough when you’re happy with the quality of content you’re promoting and your audience enjoys it. I didn’t have a solid brand. Another reason my blogs failed is because they didn’t have a solid brand. Because of this, I didn’t feel tied to my blog. When you have a solid brand, you become really proud of your blog. You put a lot of work into it, it took effort, and you’re treating it like a real business—whether you’re making money with it or not. I have that with And Possibly Dinosaurs, but I just didn’t with my old blogs. For some of the blogs, the name was too common, so it wasn’t catchy. On others, the name was great, but it was waaaaaay too long. And sometimes the name was there, but that was it; there was nothing visually appealing or consistent about it. All of these make it hard to promote the blog, because it doesn’t feel like there’s an “it” to sell or promote. It’s blah, or it’s confusing, or it just doesn’t click. To prevent this from happening to your own blog, spend some time (or, if you can, money) developing a strong brand for your blog. This includes the name (and, ideally, domain name) and logo, but also goes beyond that: colors, fonts, look and feel, voice, etc. How do you want your audience to feel when they come to your blog? Excited and energized? Relaxed? Angry? Powerful? Develop a brand that reflects that, both visually and in your writing. I let myself give up. And finally, I let myself give up on my old blogs. When it got hard, I just stopped. I didn’t power through and adapt to the changes I felt were necessary. Quitting was the easier option. But you know what? I’ve had many of the same thoughts with And Possibly Dinosaurs. Do you know how often I’ve thought about shutting my blog down and not looking back? A lot. But I didn’t let myself, and I’m so glad I didn’t. This sounds like an easy fix, right? Just don’t let yourself quit. But in reality that’s so hard to do. If you need a break, take a break. But my best piece of advice? Have a timeframe of when you’re going to come back. If you take a break with no plan to return, you’re likely going to end up quitting without realizing. And once you come back? Work through what’s turning you off from your blog. Find someone you can talk to about it (ideally someone who already understands the blogging industry) so you can work through the issues you’re having. Chances are you’re going to come back way more energized, and with a much stronger blog than when you started. There are a lot of reasons my old blogs failed. Hopefully these insights will help you continue your blogging journey for years to come! Thanks for sharing! I recently launched my blog (which was a HUGE learning process!). Now that my site can take a break from me configuring and tweaking it, I need to start focusing on brainstorming and developing content along with establishing a posting schedule. Also need to start setting some goals. Thanks again, and I love your end advice—don’t give up! Eep, that’s so exciting! Good luck!